While the Denver City Council deliberates over how to expand the sidewalk network citywide and city officials embark on a two-year process to create a pedestrian plan, advocates have been pounding the pavement to show exactly what needs to change. 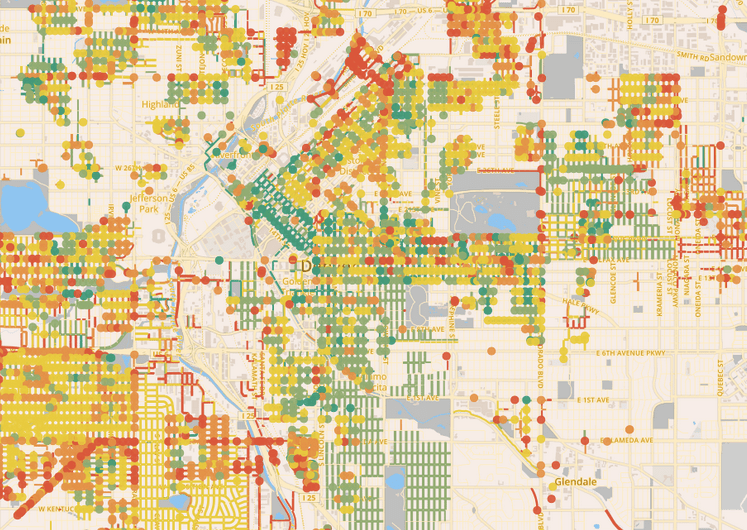 WalkDenver and the Community Active Living Coalition recently crowdsourced a ton of new data for WALKscope, the app that lets you map and rate the quality of sidewalks and crosswalks around the city. WALKscope is the only visual inventory of Denver’s walking network, and it recently grew 60 percent in just two weeks. The surge of data came from a contest sponsored by WalkDenver and CALC. Teams from Athmar Park, Barnum, and Sunnyside added the most information, and each won $1,000 for a neighborhood walkability project, like street art or wayfinding signs. The lack of good data is a huge barrier to better walking infrastructure. Denver, a self-styled Vision Zero city, can’t eliminate traffic deaths without a safe walking network. And the city can’t improve its walking network if it doesn’t know where the weaknesses are. And yet, no city department has an inventory of the city’s sidewalks and crosswalks. Despite WalkDenver’s contribution to advancing the city’s understanding of its own pedestrians network, the Hancock administration snubbed the organization from playing a major role in the city’s upcoming pedestrian master plan. An earlier version of this article erroneously suggested that the Community Active Living Coalition is part of the Office of Sustainability. Nice graph, for all we know it went from 3 to 6 people.